1993 Craftsman LT4000 heavy mud build. Wow look at the carnage. 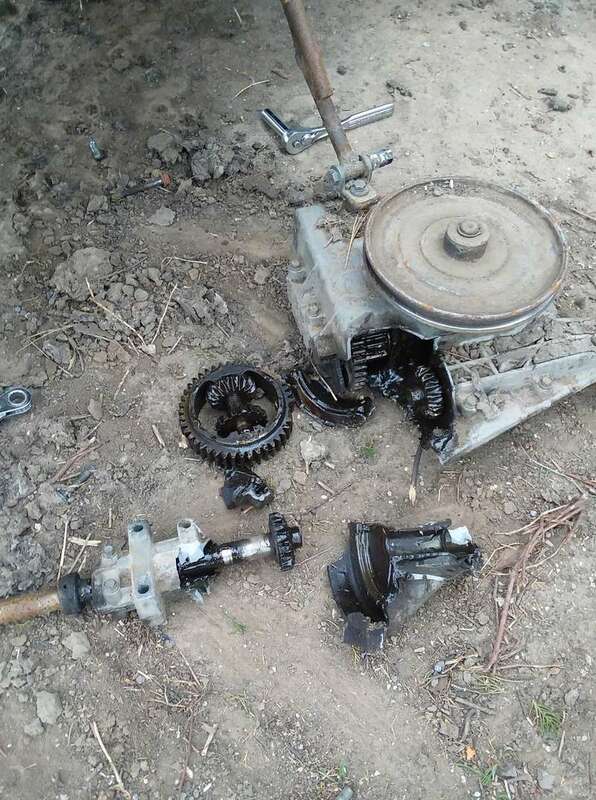 What kind of transaxle was this one? So I came up with an idea to help stop this problem. If you look at some of these cases there's a lot of valleys and voids created by the different gussets cast into the case. What if you were to fill all of these up with JB weld or epoxy mixed with metal filings. I think this could really add to the cross section of the case and make it stronger. I thought about taking my broken 820 case to school and welding it back together with the spoolgun, and then adding a metric sh*t ton of aluminum plating to it. Not like i was gonna break it any worse than it was. Never got to it though. I might be able to go in there sometime and do it I guess. I feel like gusseting a transaxle like guys do with differential axle would be a good idea. As long as one was equipped to weld aluminum, haha. I think my dad's MIG could be set up to do aluminum. Would need 100% argon though, I think. not 75/25. I was walking down the tree row the other day and found the from trans mounting brackets lying on the ground. So I think I was running it with only the rear axle brackets and I flexed the Skittles out of it and it gave up under the misplaced stress. Ugh! That sux. How long you think you went without the front braces? Yeah that missing brace explains a lot. Yikes. There's a great picture for the fail thread! Haha. Yeah you really seen to be having bad luck as far as transaxles. Man those are some nice hubs on that unit. Is $200 a bit much maybe? I suppose it'd be worth it though to be able to stop having to mess around with wimpy transaxles. Well 248.......... Still I think it could be worht it. There is a old Murray gt in town that I might be able to buy but the guy probably still uses it . It doent have a deck or hood but he might pull stuff around with it or something. I have my finger on the "place order" button. Shipping for me would only be $31. This would be a great future upgrade for my green machine. YOU'D BETTER NOT!!!!!!!!!!!!!!!! I am seriously considering it as I really need it , not to replace a stupid hydro. And I might get the cash for it too lol. Don't worry about me buying it. Remember the famous junkyard where Redline got all of his 820s for his famous mtd build? That junkyard is only 40 minutes from my house and he told me in the chat box around christmas time that he recently saw another 820 for cheap there. I would like to find a mower salvage yard but there's nothing I have come up with so far. I might start calling mower repair shops and seeing if they have any gts or Murray's with mst 205 or 206 thats are being parted out. @biggasmowers There's got to be transmissions you're looking for by you. Here's the deal, in the consumer mower world, generally the deck rots out or the motor blows first. The leaves the tractor useless to the average consumer, but that means there should be a good supply of gently used transaxles out there. I bet with some visits to local repair shops and some phone calls you can track some down locally. yeah, i might also post on craigslist wanting used mowers . that might work too. ( ive been to one repair shop nearby and they only had foote/dana/spicers and the person there was a complete idiot . he said there weren't any transaxles with complete bearings in them, i mentioned the 820 and he said they didnt even have them but i knew better. and he charges 85 bucks a mechanical hour plus parts !!!!! i dont think i will be going back to him ever and everyone knows they scalp people for repairs and are not good mechanics. Takes an experience like that with a bad shop to show you how good you have it at the right shop when you find it. If only my boss would understand this concept. Subject: Re: 1993 Craftsman LT4000 heavy mud build. » Craftsman lt1000 mud mower build "Joey"
» Craftsman Hydro 4x6 utility build.